As we are all aware this year is the 100th anniversary of the start of the First World War. To mark this important milestone, and to keep faith with those that made the ultimate sacrifice in order that we have the freedoms we enjoy today, the School will be participating in a number of events. Children in Year 3 and Pupil Council representatives from Years 1 and 2 will attend a service in St Mary’s Church and at the War Memorial in the churchyard. Form captains from the Prep & Senior School led by Head Boy Sam Masterson and Head Girl Beth Lamb will represent the School when the Stockton-on-Tees Garden of Remembrance is officially opened by Mayor, Councillor Barbara Inman on Friday 7th November. Pupils in both sections of the School will join together at 11 O’clock on Tuesday 11th November for a minute’s silence. 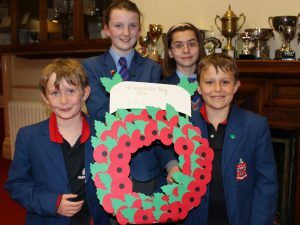 Poppies, sold in support of the Royal British Legion, are available in both School offices for a suggested minimum donation of £1.00.